We found this beautiful sketch at One Pink Goose. Another excellent photograph found on flickr. This one is by Mark Cummins. If you click on the photograph it will take you to the URL where it is originally posted. This is the Corvus frugilegus which means “food-gathering” in Latin. They are more commonly referred to as the Rook. I have not had the great pleasure of seeing this bird in person but I am very excited to learn about it. It looks like a harsher, thinner crow. It appears, to me, to have had a hard-knock-life. I like how it wears its character, much like I relish the quirks in people; a wrinkle earned through years of laughter and tears, an innocent freckle just above the wrist, the shy happiness in a crooked smile, the confident swing of a left-leaning gait. It seems it is found all over Europe and east of Europe. I read that it is found in Great Britain quite frequently. The Rook nests together in a colony. This is commonly referred to as colonial nesting which means nesting with many other birds in a safe place and living commune-style. The Rooks learn from one another and find food together. They protect one another but they are still predatory birds, so they can be found stealing from another from time to time. They prefer to nest way up high in trees. They typically have 3-5 eggs which are incubated for 16-18 days and the fledglings are cared for by their parents and other rooks for about a month. Once fully fledged, they get together with other single rooks and sometimes even jackdaws and fly around, presumably deciding who they will mate with in the future. Or perhaps just enjoying the free, young, single life…flying around without a care. You can hear a rook here. It sounds much like most crows but maybe a little throatier which matches how they look, for me anyways. =) I like their throaty “caw”. Rooks are interesting birds. And so they are written about…people speculate about their abilities and even conjure up powers for these intelligent birds. I found the following on Wikipedia… it is a direct copy and paste but interesting. Like many other members of the Corvidae family, the Rook features prominently in folklore. Traditionally, Rooks are said to be able to forecast weather and to sense the approach of death. If a rookery — the colonial nesting area of rooks — were abandoned, it was said to bring bad fortune for the family that owned the land. 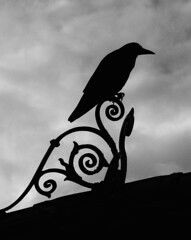 Another folk-tale holds that rooks are responsible for escorting the souls of the virtuous dead to heaven. William Butler Yeats may be making reference to the latter tale in his poem The Cold Heaven. In Neil Gaiman’s Sandman comic book series, Abel reveals that the parliament would surround a single rook, with that one telling a story. If the story was not liked, the parliament would attack and kill the speaker. In Brian Jacques’s Redwall series, rooks make an appearance in Mattimeo. Rooks, along with magpies and other similar birds make up the army of General Ironbeak, one of the villains in the book. In Susan Cooper’s The Dark Is Rising series, rooks are seen as agents of the Dark and the sign-seeker, Will Stanton is warned never to fully trust one. In Phillip Pullman’s book Northern Lights Lyra Belacqua and Roger Parslow catch and heal an injured rook on the college rooftop. In Stephen King’s Dark Tower entry Wizard and Glass, one of the characters, Cuthbert Allgood, carries a rook’s skull tied around his neck, claiming it as a good luck charm. I am now an official fan of the Rook. I may always have been but I simply did not know it. Do YOU have a Rook story to share with me? I would love to hear one (or many!) If so, e-mail me below. Ok, I know! I am going hogwild with the flickr photos today but really, aren’t they worth looking at? This is a beautiful photo by Mark Cummins (on Flickr) of a Rural Rook. They are so interesting to look at, they are thinkers. I can appreciate that quality in them. Unfortunately, I have never seen a rook in person. Poor me. I will do some more research on rooks and see where I can find them. I should know this but I am on a journey of exploration here.